MiniBin is an application devised to be a trash bin for your system tray. Sometimes the little programs created by smaller independent developers are more useful to me then some of the paid software I have. MiniBin is one of those handy apps I use now on a daily basis on my Windows machine. It is an application devised to be a trash bin for your system tray. The recycle bin can, at times be the culprit consuming a large portion of your disk space. And if your disk is so full that you are receiving the ‘low disk space’ alerts then it can be quite annoying having to minimize all of your current windows to continually empty the Recycle Bin. MiniBin can be convenient for those people who may wish to avoid this inconvenience or the ones who hide the trash bin from the desktop. With MiniBin you can empty the trash, view the trash size and rename the Recycle Bin functions. From the system tray just right-click on the context menu, where you can open the Recycle Bin, empty trash, exit MiniBin and Configure settings. 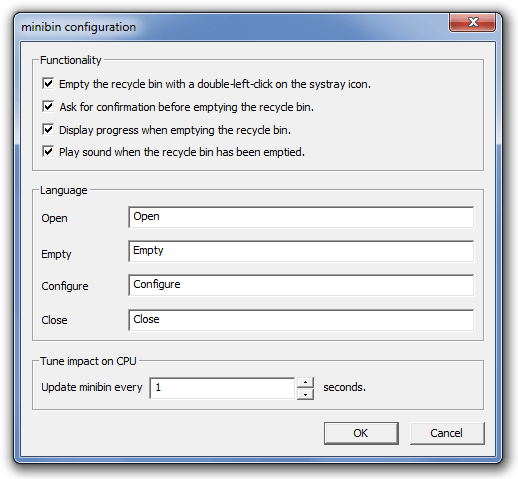 Other splendid features MiniBin offers are the ability to enable emptying the trash with a double click, set a prompt before deleting trash, play sound when Recycle Bin is emptied, and enable progress view for the deleted trash from Configurations. You can even change the names of the default functions according to your preference. MiniBin is currently free and can be downloaded from the e-sushi.net website. MiniBin has been tested to work in Windows 7 but it’s status is unknown on earlier versions of Windows.